Raw vegan Jell-O is awesome–it’s got a great texture, takes minutes to make, and is a light, fresh take on dessert. This is a low-glycemic version suitable for those on low-sugar diets. Soak the Irish moss overnight. When it’s all plumped up with water, Vitamix it with a little bit of water until it’s an even, gooey consistency. 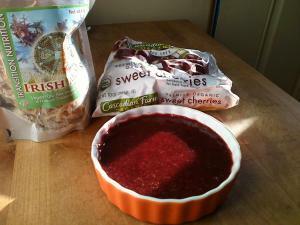 Then, add frozen cherries, Stevia, sea salt, and Xylitol to taste. Chill in the fridge for a couple hours. Enjoy! 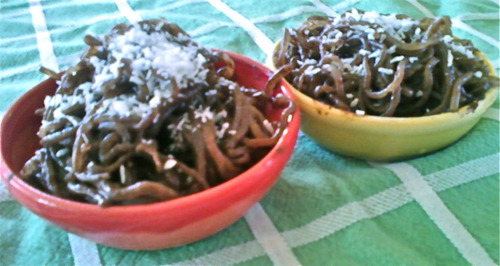 Raw kelp noodles were begging to be used in a dessert recipe. Evidence: They have practically no flavor after you soak them, have a super-awesome texture and there’s like three calories for a big bowl, and they’re available in many health food stores for only a few bucks. They soak up sauces (check out the wonderful Heather Pace‘s delish-looking recipes for savory raw vegan kelp noodles) and keep their form in both hot and cold dishes. Imagine eating raw cacao-coated kelp noodles, oozing with flavor but still light and low on the glycemic index. Yes! I hope others start experimenting with the concept of kelp in dessert! Soak kelp noodles for a while; 20 minutes is good, or you can do longer if you’d like them to be a bit plumper. Melt the cacao paste (with a dehydrator, or on the stove with low heat, or in the sun…), then add a bit of cold water and immediately stir frantically until it becomes a mousse. Add in stevia to taste and a dash of sea salt. Then, toss in the kelp noodles and coat evenly. Chill in the fridge. Add a sprinkle of coconut as garnish, or perhaps some other topping you’d like. Enjoy!